This tab appears in the Mailbox Properties dialog and is used to configure what happens to messages after they reach a specified age. Mailtraq has two options for Archiving depending on the Database Mailtraq has been set to use: Firebird or AFX. The way messages are handled varies depending on the selection. AFX has been the default option since March 2009, and is the recommended choice for nearly all users. It provides individual archives for each mailbox. When you are using AFX, messages are moved from the mailbox to the matching archive in the database, based on the configuration set here in these Mailbox Archive-tab options and according to the Options | System Archive... settings. Read about accessing Archived messages here. Archiving can be processor intensive, particularly if you impose expiry to archive on a mailbox with a large volume of mail. Mailtraq provides Database Maintenance controls to allow you to manage this process. It is essential to configure suitable maintenance for the efficient running of your mail storage services. If this option is selected then messages will be archived according to the settings defined on this tab. This determines how old the messages must be before they are archived. The age is defined by how long the message has been in the database, not necessarily how long it has been in this mailslot. When messages are drag-posted between mailslots the age is reset (as the resulting message is essentially a new message that was forwarded). Messages that have been recovered from the system archive are marked as no-archive (view Message Properties to see if this is the case for a message) and will never expire. If this option is checked then a notice will be sent to the return-path of the message sender when the archiving or deletion takes place. This would not normally be enabled and it is not Internet policy to send out such notices, but in specific cases where a mailslot is used as a queue for automatic notices. Automated responses to mail messages can be regarded as a security risk in certain circumstances. 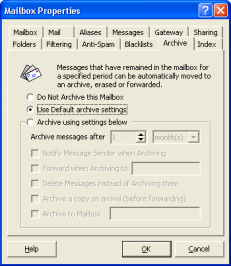 Check this option to have the message sent to a specified e-mail address when the archiving takes place. This address can be a regular Internet address or the name of a local mailslot. A copy is also Archived unless the following control is also enabled. If this option is checked then messages will be deleted rather than being archived and will not appear in the system archive. This is the setting most often selected for a 'spam' or similar mailbox. System administrators should have a mail retention policy in place that meets the regulatory needs of your industry. It is good practice to consult your organization's legal representatives on this policy to ensure that users do not retain messages longer than appropriate. When does archiving take place? If you opt to Postpone then it is important to make sure that you do not restrict the Maintenance period to shorter than the amount of time required to perform the archiving and other maintenance activity. (e.g. 4 hours = hourly, 2 hours = every 30 minutes). If the "Archive after" is less than one week, archiving takes place once per day. Otherwise it takes place once per week.